Public adjusters help insurance policyholders get the best result from their insurance claims. To understand what public adjusters do, it is necessary to understand how insurance works. Individuals and businesses buy insurance against potential losses or disasters. If the worst happens, for example, a house burns down, an insurance company should pay the policyholder to replace it. Unlike the insurance company adjuster, whose job is to manage – and not overpay – a claim, the public adjuster is wholly on the side of the policyholders. Their job is to make sure full benefits are paid and barriers to payment are efficiently removed. For this reason, public adjusters are sometimes viewed as the white knights of the insurance world. Despite this impression, the public adjuster is a hired hand, not a public service advocate working for the proletariat. Policyholders are the ones who pay public adjusters, not the insurance company. Because of this, they generally only work on larger (in excess of $10,000) claims. There are no uniform requirements for becoming a public adjuster, beyond having a high school diploma or GED. That said, most successful public adjusters have a bachelor’s degree and prior experience working for an insurance company as a claims adjuster. Most public adjusters have worked for insurance companies. Insurance companies typically prefer to hire candidates with a college degree, so it is ideal to obtain one. The degree can be a bachelor of science (B.S.) or arts (B.A.). While the degree can be in virtually anything, if the candidate knows he or she wishes to work in a particular industry, it may be wise to get a degree in a related field. For example, if the goal is to focus on financial loss calculation as a public adjuster, it may be useful to get an accounting degree. Another reason to get a degree is that clients will have more confidence in public adjusters who have one. Since most public adjusters are self-employed, building client confidence is essential. Licensing for public adjusters varies from state to state. For this reason, it is wise to understand the licensing requirements in each state targeted for practice. Some states have reciprocity agreements, allowing practitioners to work in their state with a license from another. Some states require educational program completion or passing a licensing exam. Others may require work experience as a claims adjuster or a combination of education, experience and exam passing. Public adjusters perform many activities that are identical to those of a claims adjuster, so working for an insurance company can offer ideal training. Additionally, some states require claims adjuster experience to obtain a license to practice as a public adjuster. If the state, targeted for practice, requires a license, now is the time to complete any activities needed to gain the license. This can include course work, experience, passing an exam, or a combination of these. This program, administered by the Institutes, is designed to provide practitioners with the technical knowledge to be public adjusters. To engage in this program, candidates must complete the Institute’s four foundation courses (Claim Principles and Practices, Property and Liability Insurance Principles, Property Claim Practices and Property Coverages), as well as passing an ethics exam. For example, being a member of the National Association of Public Insurance Adjusters (NAPIA) can be helpful in building a practice. This voluntary membership organization offers content and community around building a practice as a public adjuster. Local organizations can be useful places to network for business. Working for another public adjuster may provide valuable training and reduce some of the risks inherent in setting up a solo practice. Alternately, establishing a solo practice may offer greater freedom and financial rewards. Clients choose to work with public adjusters for three main reasons. First, they want their settlement maximized, and professionals are the best people to do this. Second, they want to avoid the hassle of dealing with the insurance company. Insurance claims are stressful and coping with a loss can be very emotional for a policyholder. Hiring a public adjuster allows clients to delegate the frustration and hassle of contending with an insurance company. Third, hiring a public adjuster can feel cost neutral, since most are paid a percentage of the recovered amount. While this is real money, policyholders don’t have to come up with it out of pocket. Additionally, they estimate that the public adjuster will get a result that exceeds the percentage of their fee, again making payment cost neutral. For example, if a public adjuster charges 10% of the recovered claim, it makes financial sense to hire one if the policyholder estimates that the public adjuster will secure a 10% better result than the policyholder could on his or her own. A flow of an insurance claim can go like this: A family (the policyholders) have been paying home owner’s insurance. One day, the dryer vent overheats and the house catches on fire. The policyholders place a claim for compensation. The insurance company assigns an adjuster to review the claim and pay the policyholders appropriately. In a perfect world, this process goes smoothly and the policyholders are able to quickly rebuild and restore their home. However, when it comes to larger claims (in excess of $10,000), policyholders may need professional help to get full benefits from their insurance company. They may have to prove that the items they lost in the fire existed, or that they were fully complying with the terms of the policy. Alternately, the insurance company’s estimate of what it will cost to rebuild the home, may be lower than that of the policyholders. In this situation, it can make sense for the policyholders to hire a public adjuster. It’s important to note that public adjusters are not attorneys representing insurance companies who are suing one another over a large claim. Public adjusters perform a pre-litigation service, helping the insured and the insurance company come to a satisfactory (for the insured/policyholder) conclusion before one party files a lawsuit or complaint. Public adjusters are often self-employed and have prior experience working as adjusters for insurance companies. Fee schedules can vary. Some public adjusters work on a contingency basis, charging a percentage of the overall insurance claim. Being a public adjuster is a career choice that usually requires several years of insurance experience after college. What Does an Average Day Look Like for a Public Adjuster? A day in the life of a public adjuster includes many different duties. Generating new business is always going to be important for a public adjuster. Many are self-employed or are working for a firm of public adjusters. This means routinely meeting with potential clients to discuss their claim, get the details of their policy, and understand any issues or concerns they have in dealing with their insurance company. At this time, the public adjuster will need to discuss compensation with clients and gain agreement to work on their behalf. The public adjuster will review each client’s policy in exhaustive detail. The goal here is to fully understand all of the technical aspects of a policy, identifying any opportunities for payment as well as barriers to satisfying a claim. Some public adjusters specialize in certain types of claims. For example, some may work only for businesses while others may focus on homeowner policies. The public adjuster must also review in the claim in detail, collecting all information and facts. These activities are almost identical to those of an insurance adjuster. They can include collecting evidence, assessing damage, reviewing assessments made by others and interviewing witnesses and experts. Collection of detailed information helps the public adjuster prepare the claim to the greatest possible advantage to the policyholder. Public adjusters prepare accurate, thorough claims in a format that an insurance company can understand. This can speed the process because public adjusters “talk the language” of insurance companies, giving insurance company adjusters the data they need to more quickly resolve a claim. Using an adjuster also demonstrates to the insurance company that the policyholder is serious about their claim. Where there is dispute, the public adjuster negotiates with the insurance company to get the fairest settlement possible under the policy. As professional negotiators, their success rate is generally higher than individuals handling negotiations on their own. The public adjuster’s job is complete when the insurance company releases funds to the policyholder. If payment from the insurance company is delayed or slow, public adjusters may assist the policyholder in speeding payment. Because public adjusters are often self-employed, they may perform the tasks of any small business owner on a daily basis. These can include everything from ordering supplies to paying bills to dealing with taxes and permits. Are You Suited for a Career as Public Claims Adjuster? Claims adjusters must be able to understand insurance policies, which are often written in an obtuse and confusing fashion. It is also recommended that potential public adjusters complete a bachelor’s degree, as these are strongly preferred by insurance companies hiring adjusters. Additionally, states have varying requirements for education, certification and experience. Finally, public adjusters working in technical areas must be able to stay up to date on related topics. For example, a public adjuster working in health and medical claims must stay current on medical terminology. Public adjusters must be able to closely observe and document all elements of a claims situation. Public adjusters must be able to evaluate claims and make fact-based assessments on what can be required from an insurance company. They must be able to calculate damage, assess replacement value and make other data-driven determinations used to settle a claim. In some instances, software assessment programs may be used. In others, the ability to perform hands-on research is necessary. Public adjusters must also be able to fully comprehend the provisions in insurance policies and their effects. Listening. They must be able to listen to clients, experts, witnesses and insurance company employees who may have different perspectives. They must be able to ask probing and detailed questions, and understand the answers. Speaking. Public adjusters must be able to explain their findings in a way that policyholders and insurance company employees can understand. An effective presentation manner is also helpful in securing new clients. Public adjusters are expected to negotiate on behalf of their clients, securing the best possible result for settling a claim. This requires staying calm under pressure, being able to present a convincing position and being unafraid of discussing points of conflict. Public adjusters are mostly self-employed, so they must be able to continually secure new business. They need to inspire the confidence from potential clients, as well as professionals, who might refer clients. They must present a sympathetic, capable image at all times. Public adjusters typically work full time, mostly during business hours. However, the need to interview witnesses, fact find and work with busy clients may require some evening and weekend hours. Public adjusters are most often self-employed, which means they must contend with the ebb and flow of revenue that comes with owning a business, as well as continually working to secure new clients. Adjusters perform work outside an office setting, inspecting properties, interviewing witnesses and experts and the like. Requirements for being a public adjuster vary from state to state. Some states have almost no requirements, while others require education, certification, work experience or a combination of any of these. This is useful in securing insurance company employment as well as building confidence from potential clients. It’s helpful to get a degree in an anticipated area of specialization. Public adjusters can major in virtually anything that interests them. Prospective public adjusters who want to work in a highly specialized or technical area should consider majoring in a related topic. Top schools for any major will vary by major and region. It is not generally necessary to attend an elite or Ivy League university to gain an entry-level job in the insurance industry. Most public adjusters have several years of work experience as claims adjusters. Somee states may require such work experience. These vary so it is important to check each state targeted for practice. The Senior Professional Public Adjuster (SPPA) designation can be helpful in practice building. It is administered by The Institutes. 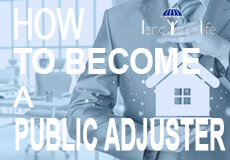 How Does A Public Adjuster Find Work? Most public adjusters are self-employed. Their practices are built using tactics typical of any self-employed professional. Public adjusters need prior experience and basic education to start a practice. Consider that clients hiring adjusters are placing trust in the adjuster, and will want to hire someone who appears expert and educated. Secure a bachelor’s degree in a related field and get industry experience as an adjuster as quickly as possible. Be careful to maintain positive relationships at all levels. While public adjusters work on “the other side of the table” from insurance adjusters, positive and collegial professional relationships at all levels can speed resolution and generate referral business. A key source of clients is through referrals from other professionals. Join local networking organizations and build relationships with other professionals such as attorneys and accountants. Both the National Association of Public Insurance Adjusters (NAPIA) and American Association of Public Insurance Adjusters (AAPIA) offer national directories. Some regions offer local associations for public adjusters as well. Self-employed public adjusters will need a professional business presence. This can include a website, a professional profile on business social media sites (for example, LinkedIn), as well as an appropriate profile on social media sites. Office space may also be necessary, even though it does not have to be large. Contributing articles to local media, sponsoring events and the like can help establish a business presence. Some targeted marketing campaigns may be helpful. These can include local radio advertising, directory placement, and other media placement. It may be most effective to start practice working for another public adjuster or a public adjuster firm. This will help the new practitioner learn most effective ways of securing new business as well as managing and resolving claims. What is the Average Salary of a Public Adjuster? The Bureau of Labor Statistics (BLS) does not track public adjusters individually, but it does track claims adjusters, appraisers, examiners and investigators. The median annual wage for this category was $64,690 in 2017. Because public adjusters are paid a percentage of the claims they settle, some make significantly more money than insurance company-employed claims adjusters. Balancing the income potential, however, is the pressure to continually build a client base and the ebb and flow of payment. Job growth estimates for claims adjusters are modest and it is probable that the growth rate for public adjusters mirrors this number. The BLS expects the number of jobs for claims adjusters, appraisers, examiners and investigators to decline 1% from 2016 to 2026. That said, some experts see a growth trend and need for adjusters, due to an aging population and increasing medical insurance disputes. While automation will reduce the need for adjusters working on less complex claims, people will still need adjusters for more complex, higher value claims. Though growth estimates aren’t high, the top growth areas for adjusters will probably be in the health insurance industry as the number of customers and claims grows. In property and casualty, the number of claims will be highest in areas prone to natural disasters. The National Association of Public Insurance Adjusters (NAPIA) is a voluntary membership organization open to public adjusters as well as related professionals (attorneys, engnineers, accountants). The American Association of Public Insurance Adjusters (AAPIA) lobbies for the profession, provides a directory, online courses and more. Various regions have membership organizations for public adjusters. For example, the Rocky Mountain Association of Public Adjusters is a membership organization for public adjusters in Arizona, Colorado, Idaho, Montana, Nevada, New Mexico, Utah, and Wyoming. The National Association of Independent Insurance Adjusters (NAIIA) supports the ethical expansion of the independent adjuster profession. I’m getting ready to take my test in pa. I have 2 misdemeanors but no felonies. I’ve gotten my life together over the past 2 yrs. 8 years in the industry off and on for 20 yrs doing fire, water, mold remediation and obviously smoke and odor control. I don’t know what PA State requirements entail. I’ve worked hard and pray that if I pass those 2 misdemeanors will not hold me back. Awesome information! Spot on! I’m an Independent Claims Adjuster, I work CAT claims. However, after speaking to so many homeowners who need assistance with their claims, I’m compelled to be a Public Adjuster. They don’t always get the best rap from insurance companies, but I’m determined to give it a shot! Wow, I had no idea that there was so much to learn about becoming a public adjuster or that the job was so complicated. I am particularly interested to learn that a day in the life of a public adjuster is so busy. Although it does make sense that you would need to meet with several clients so that you can talk about their claims in detail. I’m glad you mentioned that public adjusters need to be able to explain things in a way that people can understand. I have been thinking about becoming a public adjuster this year. I wasn’t sure what skills were required. I’ll try to learn how to explain efficiently. Thanks for the advice! I really like how you talked about working with a public adjuster being a way to maximize your settlement. We’ve been working with our insurance company, and I would love to have a public adjuster to help us get the most out of our claim. I’m going to have to talk to my wife and see if we can find a good public adjuster to help us work with the insurance company, and get the most out of our settlement like you said!